A couple of years ago, my wife and I decided it was time to find more space. We found 11 windswept acres with a stable for her and tower sites for him! 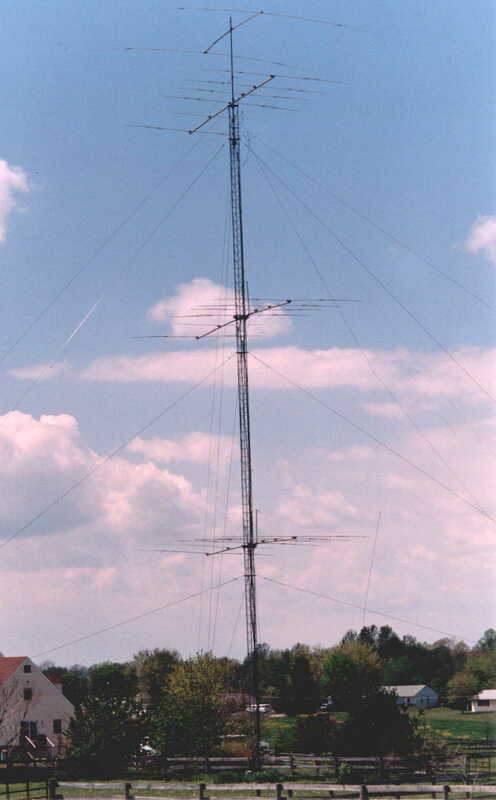 I quickly acquired 110' of Rohn 45 and, with a lot of help, erected my existing tower. Wanting to keep down as many interactions as possible while maximizing efficiency, I looked at different alternatives for non-conductive guy material. After ruling out Phillystran as being too expensive, I found out about fiberglass guy rod from our local tower and rotor man, Norm Jeweler, K3LYW. I contacted the manufacturer and decided to organize a group purchase of 3/8" fiberglass guy material. At about 1/3 the cost of equivalent strength Philly, it seemed a good alternative. It's extremely light and strong, and doesnt require all those clunky insulators, etc. However, like Phillystran or even more-so, it does not tolerate abrasion (anyone considering using it should do their homework, as handling is much different from steel). Since I'm not a particularly patient person, I decided I had to have all bands going on this one tower so I wouldn't have to wait to be at least a "pop-gun" on all bands. After seeing the recent article about stacking tribanders that appeared in QST, I decided to stack 3 KT34XA tribanders and feed them with the WX0B Stackmatch box. N3RR was in the process of building his new tower at that time, and he organized a group purchase of TIC ring rotators, so I bought a couple for my lower 2 tribanders at 38 and 72 feet. I decided to use the tried and true T2X rotator on top turning a 20 foot chromolly mast which supports the top tribander at 112' and a W6QHS++ 402CD at 125'. The latter, sporting a beefed boom and HyGain mast clamp required no truss, so it's right at the top. For 80 I put up an Inverted V at 100' broadside to EU and a 1/4 wave sloper for 160. At present I'm using a couple of dual-band EWE antennas for receive on 80 and 160. Of course, with the tower 150' away from the house, and the rest of my future plans much further away, I had to find some cheap hardline to make sure all those db's made it to the antenna! I made some contacts and hauled off trailer loads of old partial reels of CATV hardline in a different sizes. I've got a about 30 reels at the back edge of my property! I also made a deal for a few thousand feet of some government surplus 7/8" 50 ohm line at a very nice price. So, I've got several runs of 3/4 and 7/8 inch hardline as well as several thousand total feet of 3 conductor UF electrical cable for control lines buried in the trench to the tower. As it turns out, this direct-burial "house-wiring" cable is very economical when compared to the specialty rotor cables you can buy. As an after thought, I also buried a run of the cheap 4" corrigated drain pipe as a conduit with a pull-rope for any future additions. I've already added a couple of runs of RG8X for RX antennas, so it's been a big plus. With the solar flux index climbing recently, I saw an immediate need to be able to run both radios on separate high bands at once. The obvious solution was to add a bypass relay to the Stackmatch system to allow feeding one of the tribanders separately from the other radio system. It seemed the most logical way to do it was to break the feedline for the top XA and install a high-isolation coaxial relay in the line, allowing me to reroute the top antenna directly to a second feedline. Since my available feedline was some CATV hardline, I used an Amidon 50:75 ohm transformer on each end to assure a good match. The relay and transformer are mounted on the tower next to the stack match in a small weatherproof box I picked up at a hamfest for a few dollars. I installed a small toggle switch in the Stackmatch control box to activate the bypass relay. I first used it in the 1997 SS CW contest and it was an instant success! I use the top beam for 20 or 15 meters and the bottom 2 on 15 or 10 meters. ( Since then Array Solutions has added the 2 feedline option for the StackMatch and we build 75:50 ohm high power transformers as well....WX0B). The bottom 2 stacked works extremely well on 10 meters...usually better than any other combination. On 20 meters, the top 2 seem to perform as well as all 3 almost all the time, so if I'm on 20 only, I'll take the bottom yagi and aim it south or west to pick up another direction easily while the top 2 take care of EU or JA. On 15 I've found different combinations work at different times, but usually all 3 is best. Having all 3 antennas able to rotate independently can be very important for many situations, especially in contests where you can work both US and DX for points. Although the KLM's dont have particularly good patterns, higher gain antennas mean a sharper front lobe which makes it that much more important to be able to turn each one. My list of wins with this arsenal includes SS Atlantic Div, High Power, 1995 Phone and CW, 1996 Phone, and high claimed 1997 Phone and CW as well as the 1997 IARU Radiosport in SOHP Mixed mode. I've also won numerous RTTY contests in the high power single op category, setting the World record in the 1997 and 1998 RTTY WPX contests.